This was the official announcement that a sailplane, which had its first flight in the hands of Heinz Kensche, for two hours over the Hornberg, on the 30th November 1937, was at last cleared for production as the official and at that time modern, side by side two-seater in Germany. The Sportflugzeugbau Schempp-Hirth had been founded in 1935 when Wolf Hirth had moved to the Stuttgart area from, Grunau in Silesia. It is interesting that straight away in 1935 the firm designed and successfully flew three types. : the Gö 1 Wolf, and Gö 2 tandem seated two-seater, and the Gö 3 Minimoa, but that the Gö 4 did not fly for at least two years after that and did not achieve production for at least a year after that. The reason for that was that both the Gö 1 Wolf and Gö Minimoa were so successful that both were mass-produced; 100 of the former having been built by April or May 1938, and 100 of the latter being built by 30th June 1939. Thus, the building and mass-production of the Goevier may have been delayed, by the above work, and also by the firm building other prototypes which included the, Gö 6 (Mo 2a) -1The two-seater Minimoa. Never had there been such a two-seater before as the Goevier. For the first time a two-seater had been designed to give dual instruction from the start for glider pilots, and it was theoretically possible that a pupil could be sent solo in the glider that he had trained in, which is what happens today. Thus, the Goevier can be called the first of the modern training two-seaters. Until that time and for long afterwards, glider pilots were trained solo on primitive training gliders, which lacked performance and were not easy to fly. The new two-seater training would be better, easier, quicker and safer for the pupils. The Goevier was such a success that 100 had been delivered by January or February 1941.It were a proud moment for the firm when, within such a short it had managed to build 100 of three of its designs. The requirement for the Goevier was that it should be, able to train pilots to fly the two standard intermediate training solo sailplanes of that, the Grunau Baby 2 and Wolf. Thus it had to have a similar performance and flight handling to those two. The requirement was more than fulfllled when it was discovered that the Goevier’s performance was actually better than those of the Grunau Baby and Wolf. The Goevier was suited for basic training, conversion to different kinds of launches and to other gliders and for blind flying training, etc. Although about 120 were built, before 1945, which does not put it in the same production class as the Kranich, of which over 1600 were built by one firm alone, the RLN had wished for more Goeviers to be delivered. This was not possible, owing to the production capacity of the firm being taken up by more pressing war work. From the 1st to the 3rd of June 1939, the pilots Führinger and Hoffman flew for 49 hours 45 minutes over the Hunds-Heimer Kogel 1. This was the World Duration Record at that time. Führinger later represented Austria in an Mg-19b at the 1954 World Championships at Camphill? ailerons are lighter and more responsive than those of the Goevier, but possibly those of the Wolf are about the same. It must be remembered that the wings of the Goevier were developed from those of the Wolf and that the Goevier was supposed to train pilots to fly the Wolf and Grunau Baby. It is the writer’s opinion that a pupil who could successfully fly a Goevier solo would easily be able to manage a Grunau Baby. The Goevier’s tailplane and elevator is supposed to be similar to those of the Grunau Baby and Wolf, and therefore it is strutted, and the elevatotor is without trim tab. This means that during aerotows, a pupil has to battle not only with lateral but also with pitch control. However it must be mentioned that both Grunau Babies and Wolfs can be handfuls on aerotow, if flown too fast or through turbulence. It also must be said that although the Goevier might not be so easy to control as some of our better vintage gliders, it is easier to fly than the Minimoa to which it has certain similarities. The Minimoas ailerons have also to overcome the great lateral stability of its pronounced gull wings. lt must be remembered that the Goevier was designed a long time ago and that its wings had been developed from those of the 1935 ‘Wolf” and this must be considered as a drawback. One would have hoped for fingertip aileron response because of the small wingspan. In spite of this not being so, a good Goeviue is a delight to fly and they will out climb most other gliders in thermals. The closeness together of the two pilots, whether they are instructor and pupil or two joy-riders, makes communication no difficulty. Also the closeness of the two pilots causes warmth on cold days. Winch and Bungee launches were more popular than aerotows in those days. Perhaps Goeviers, Grunaus and Wolfs were more suited for these. Concering penetration capability, it has been stated that the max. L/D of the Series 2 was 1:19, but that this had been increased to 1:20 for the Series 3. This makes the Goevier better than a Grunau Baby but equal to a T.21. We think that Wolfgang Hutter’s attention to aerodynamic cleanliness around the nose and wing, roots must market a faster glider than T.21. 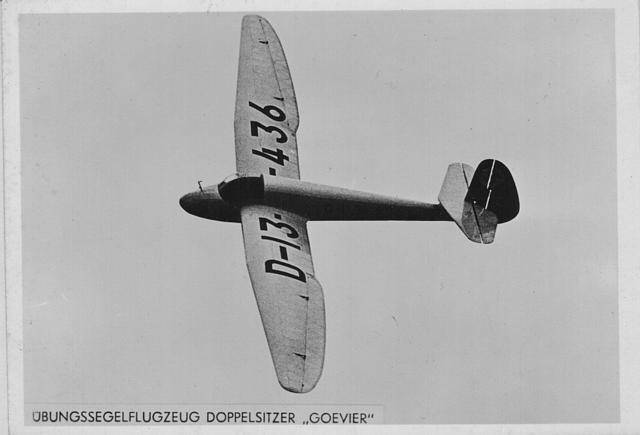 Because of the Goeviers popularity ad success, it was one of the very few pre-war two-seaters to go into production in Germany again after 1951.
directly to a decrease in the glider’s performance. In order to obtain the best possible performance, Wolf Hirth and Wolfgang Hütter designed a fuselage with the minimum frontal cross sectional area to give the two-seater the best possible performance. To still ensure the comfort of both pilots in such a narrow cockpit, the outside elbows of each pilot were to be fitted into the wing roots. It is in the wing root areas that work of Wolfgang Hütter is especially noticed. The wing roots wore built in an entirely new method, which is today used for the construction of fibreglass gliders, and had even then been previously used in the in the 1930 H.28. Hessian soaked in Phenol Haz Leim (synthetic resin glue) was put in to a female mould while a male mould was pressed in on top of it. The glue was allowed to harden and the forms were then taken out, covered, filled and painted. After they were installed in the fuselage, the result was almost perfect aerodynamic wing/fuselage transition areas. We know now that the Hortenn brothers built a ‘Hols der Toiifel’ in 1935 using conventional construction with plastic parts, and no wood, and that they built Hortenn 5 entirely of plastic in 1938, but we believe that the Hütter brothers used the mould for the first time when building the 11.28 and Goevier. The Goevier’s front fuselage was now very good aerodynamically with a large canopy to assure warmth and ease of communication for the pilots. They also both had excellent visiability which was in contrast to -the tandem seated Kranich and Minimoa 2a, where the pilot in the rear seat could see very little. The Göppinge gliders had been almost unique in having landing wheels. The Goevier was no exception in that both pilots were seated directly above a low pressure tyre so that their landings were, made as it were on a cushion of air. The seat bulkhead transferred all loads during landing’s and take offs directly to the wheels axle. The loads of the wing miain spars were carried across the fuselage by a tubular bridge spar made from 50 mm x 2 mm Crom-Molybön steel. Because of this, the main bulkhead could be built simply and lightly. The main fittings of Goevier 2 were designed for a loading of 80 kgs/sq. cm,and this allowed its cockpit max. load to be increased to 210kgs allowing parachutes and oxygen equipment to be installed. The Goevier was approved for blind, and cloud, flying. Due to its small size, landing wheel and low empty weight, the Goevier could easily be ground handled by three men. The wing-fuselage connection is through two conical bolts, for which an extractor was developed. The wing-fuselage gap is covered by a light aluminium fairing, which is easily attached. The exact fitting of this fairing is believed to be important, in preserving the excellent wing/fuselage aerodynamics, to ensure elimination of a buffet from the tailplane at low flying speeds. During the Goevier’s initial development, its rudder was changed five times. Its first, was that of the H.28 enlarged. ls second was that of the Wolf. The fin and rudder take the form of double wings each of symmetrical bi-convex, aerofoil shape. The rudder is f-inely constructed with many ribs. In 1941, the rudder was givenan aerodynamic balance surface at the top. From this time all Goeviers were fitted with these rudders. 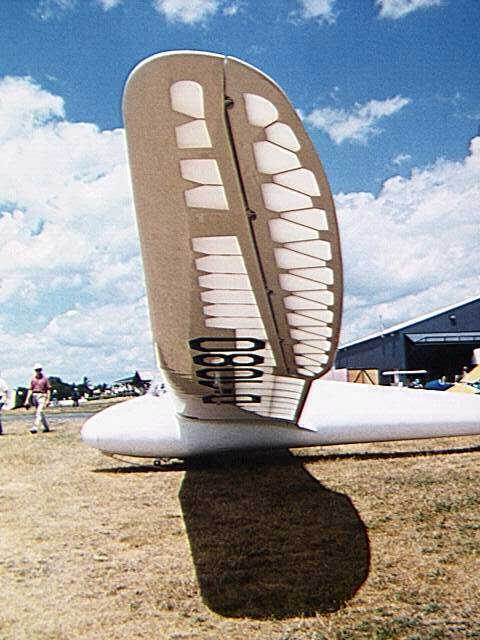 The tailplane isa refined version of the Grunau Baby and Wolfand, and that of the series 2 was plywood skinned. As it was strutted, it could be built lightly. The wings were based on those of the Wolf. It is believed that their span was reduced from 14.8m to 14.734m shortly after the machine was in mass production. 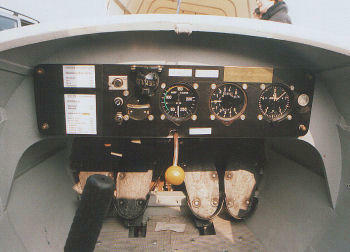 To be flown solo, the Goevier hod to have ballast installed. 25 kg ballast weights were delivered with each aircraft and these could easily be installed on the ground and fittings to take them were in the cockpit. 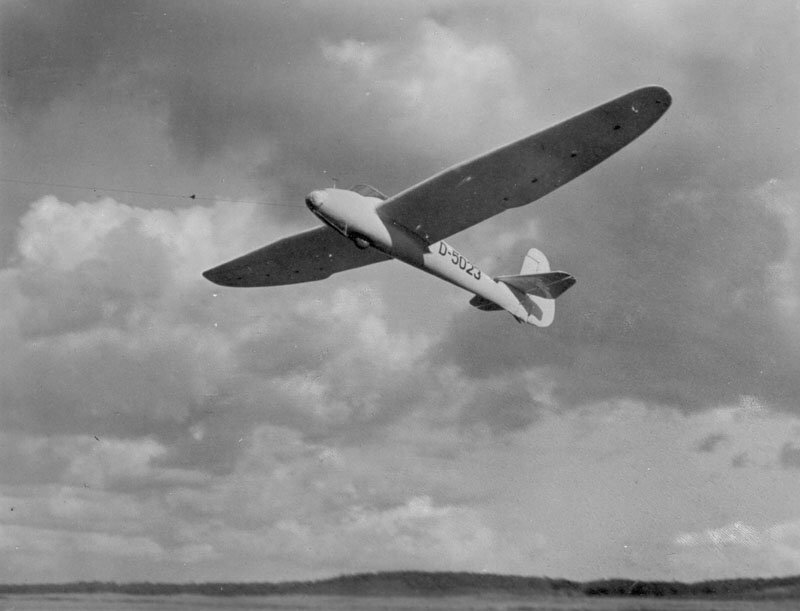 The Goevier was the first sailplane to be mass-produced with Schempp Hirth (Hüttcr) speed restricting (to 200 kph) Airbrakes, although one Ä”olf” had flown with them during August 1938. After the cloud flying accidents during the 1938 Rhön Contest, these were inst.alled in the only Minimoa 39 and Schempp- Hirth received a special Safety Prize at the 1939 Thön Contest for them. Due to the outbreak of war, only one Minimoa 39 was ever built. Although the prototype Goevier did not hove any Airbrakes or spoilers, although the latter could be fitted if asked for, the production version, the Goevier Series 2, did have them. Their quick popularity caused the Reichsluftfartministerium to order them to be instaled in all sailplanos, including the Grunau Baby 2, from early 1940. Until the summer of 1943, the firms of Haid und Neu in Karlsruhe, and W. Speiser in Goeppingen, had delvered 3050 (Schempp, Hirth) (Goeppingen System) (Hütter) dive-brake kits so that all gliders could be converted to them. The min. sink for the Goevier 4 Series 2 was 0.95 m/sec at 60kph and its best L/D was at 65 kph. It will be seen that the Goevier was yet another Hütter designed sailplane which could carry a greater load than its unladen weight. Max. permissible load was 210kgs and it would seem that this was the same for the Goevier 4 type 3. Max. permissible aerotow speed for the Goevier 4 Series 2 was 100 kph. As previously mentioned, the type became the standard side by side seated advanced training two-seater for the NSFK and the Wermacht Luft Gliding Units. Besides this, it was used for specific training. 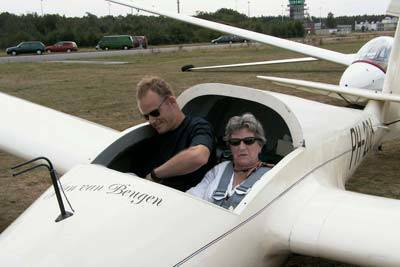 In this category, our member Max Müller of the München Oldtimer Gliding Club, flew a Goevier at night for 700 hours training night fighter pilots. Also, it was thought that Goeviers could be used for a specific operation during the much postponed 1941 Invasion of England. The operational requirments called for it to be able to carry out a quick steep diving approach before landing. 80 Kranichs were also c coverted to carry ammunition or fuel in their rear cockpits. It was hoped that they would make a more dignified arrival, as the Kranichs of that time were fitted only with wing upper surface spoilers instead of dive brakeso. Also taking part, were to be Horten 3 flying wings, carrying in their centre sections and wing tips twice the amount in weight of ammunition as the Kranichs (400kg against 200kg). With this load, the Hortens could still be soared in thermals! In support were to be DFS230s, the huge HE 321 “Gigant” cargo gliders, which had been developed especially for the 1941 Invasion of England. As the Goeviers were the first gliders to be massed produced with the terminal velocity restricting Göppingen System airbrakes, they were the only gliders suited for the steep approach and we hope we will be forgiven in assuming that this type of approach would make it very likely that they and a parachute operation, were to be treated the spearhead of attack? It would seem that the British, for whom all gliding was forbidden during the war years, were now to be treated, whether they like it or not, to a gliding pageant of unsurpassed magnitude, with Goeviers as its triumphant fanfare. The well known German glider pilot, Heinz Kenesche was sent to Nabern in October 1941 by the RLN to conduct the Goevier’s steep landing approach tests. He and Hubert Clompe, the firm’s chief test pilot, found that the Göppingen System airbrakes DID NOT restrict the Goeviers speed to a safe minimum. On the 16.10 41, the Goevier D-15-1350 was dived vertically from 3500 metres. At an indicated airspeed of 210 kph, one ailreon came off, followed by the other one, with all the ribs from behind the Main Spar attached to it. This was due to flutter. In spite of this Heinz Kensche was able to control the machine sufficiently for Hubert Clompe to bale out at 1500 metres. Afetr all hope of landing had gone, he himself parachuted from it t 1000 metres. Because of the Goeviers strength, suspicions were arroused over the accuracy of it’s A.S.I.. It was found that due to a position error of it’s pitot, it was likely that the speed had been between 270 and 280kph. The outcome of this was that the ailerons were further massed balanced to prevent the high speed flutter which had caused the disintegration and a new type of airbrake was eveloped by Wolfgang Hütter. On the 11th and 12th April 1942, Clompe tested the new Schempp Hirth Air Brakes, develpoed by Wolfgang Hütter, in a Goevier for the first time.It was hoped that they would be suitable for both sailplanes and aeroplanes. The three fans came out on both the upper and lower wing surfaces and restricted the Goeviers terminal velocity, with it’s loaded weight of 400kg, to 192kph, which was 9kph less than it’s terminl velocity with the previous air brakes.At 192kph, there was still slight aileron flutter. The tests were all made two seated, with Wolfgang Hütter sometimes in the second seat. The Goevier was registered:WL-VII-53 and was work Nr. 531. A 40 degree inclination corresponded to a terminal velocity, with brakes out, of 150kph. A 60 degree inclination corresponds to a terminal velocity, with brakes out, of 170kph. Both flights were made from an altitude of 1600m and were dicontinued at 800m. A repeat of the tests with the flying weight increased to 410kgs was forbidden by the Reichsluftfartministerium (RLM)! The Sportflugzeugbau Schempp Hirth may have delivered its 100th Goevier in January or February 1941. When priority work on the Me 321 “Gigant” tail surfaces terminated Goevier production (although the RLM had ordered 126 Goeviers to be delivered during 1941 alone). After february 1941, it seems probable that another 20 Goeviers were delivered. Thus total Schempp Hirth production of Goevier series 2 was about 120 aircraft. The French Citroen Car Works completed one FM 200 (a licence built Goevier) prototype in 1945. The Dutch firm Fokker built 6 Goevier Series 2s in 1946/7. Schempp Hirth finished 21 Goevier Series 3s between 1951 and 1954.The last six of these were delivered to Holland. The Goevier Series 3 had it’s fuselage length reduced to 6.24m from the 7.26m of the Goevier Series 2s fuselage. This created a better C of G situation allowing for a greater cockpit load. The Goevier Series 3 had the stronger wing main spar developed from 1943. The rudder had to be increased in area to give adequate directional stability, owing to the shorter fuselage length. 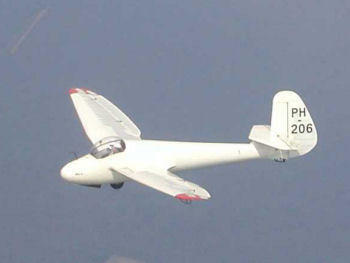 The Gliding Club of Schonbrunn Wünsidel, near Nuremburg finished one Goevier Series 2, (D-1008) during the years 1949-1951. The club members built it in secret in their homes, as gliding was not allowed in Germany until 1951,by the Allied Control Commission. Thus it may have been the first glider to have been flown by Germans in Germany since 1945. Thus the grand total of Goeviers built may have been 149 aircraft, but this is approximate as others may have been built by clubs et. The H.20 MoSe (Motorsegler = motorglider) had Goevier wings and tailplane, as well as fin and rudder. However the fuselage was steel tube and single seated. The 25hp Krautter engine was behind the cockpit and drove a pusher airscrew on the end of a pole, which was pivoted in the fuselage and could be swung out of the fuselage behind the cockpit for use. The engine was at the bottom of the pole and the airscrew on and at right angles to the other end, so that the whole unit could be pivoted as on an outboard motor of a boat. A shaft drove the airscrew from the engine. Design of the H.20 started in 1937, but its first flights were not until the autumn of 1941. Only one prototype was completed. 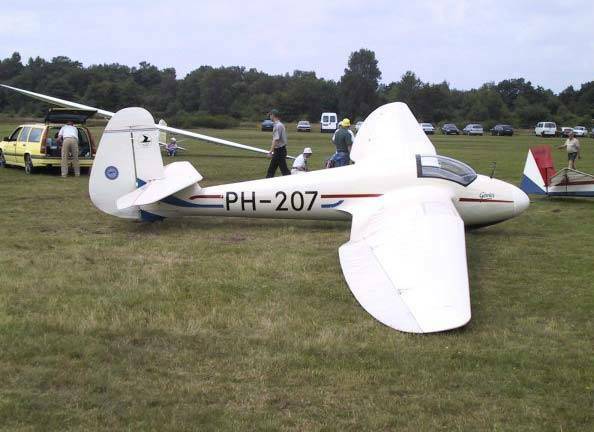 It seems to have been yet another occasion when a two set glider became a single seat motorglider. This seems to have been one of the first motorgliders, but was proceeded in 1935 by the Scud 3. In Czechoslovakia after 1945, the LG-30 “Kmotr” was built in some numbers. This aircraft was smaller than the Goevier in layout, but its wings were different in planform. We do not know whether the “Kmotr” was related to the Goevier. Goevier Series 2, BGA 1992. This is the oldest Goevier still airworthy, having had its first flight on the 16.7.43. It was probably the last Goevier built by Sportflugzeugbau Schempp Hirth during the war. It has the aerodynamically balanced rudder, which was developed during 1941. Werk Nr. Is 557. Dr. Kuettner (later killed in the Sierra Nevada wave) flew it on the 18.7.43 and Hubert Clompe, the firm’s test pilot. It is currently airworthy and is flown at the Coventry Gliding Club. Goevier Series 2, BGA 1642. This is the last of six gliders, which were built by the Dutch firm Fokker during 1946/7. Ex PH-178, Werk Nr. 6060. It’s first British C of A was gained in May 1971. This is the last Goevier in existence with the rudder of the production Goevier between 1939 and 1941, so that, in this respect, its form is actually older than that of BGA 1992. Its ailerons are very much massed balanced, probably due to the slight flutter, which led to their complete disintegration during the high-speed tests in Germany in 1941. Goevier Series 2 D-1008. 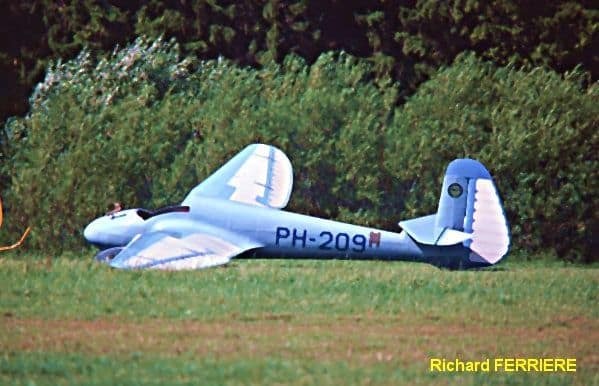 This glider was built between 1949 and 1951 by members of the Schonbrunn Wunsiedel club near to Nuremburg, using the drawings of the production Goevier 2; there being no Goevier 3s in existence at the time. For many years D-1008 was used as the clubs trainer and as the club is situated in very restrictive airspace close to the Czech and the former East German border, official permission had to be granted for almost every flight and one wonders if all its flights had to be necessarily short? However, it has come into better times as it has been bought by the members of the Münster old-timer club, who also own a Minimoa. Goevier Series 3, BGA 1783, Werk Nr 404. Originally D0001 and later D-8761. The Gliding Experimental Institute at Freiburg in Breisgau used this aircraft for wing profile research. It had a 820mm broader experimental wing slipped over the port wing from the tip inwards, so that airflow over it could be observed. It received British C of A during May 1973. The C of A expired in June 1976 after the aircraft had become damaged during Competition Enterprise. Partially repaired by the late Mike Garnett, BGA 1783 is awaiting restoration. Goevier Series 3s are to be found airworthy in Holland and Germany. Goevier Series 3, OO-ZHW, Werk Nr. 413. In spite of having a Belgian registration, this aircraft it is based at Woensdecht in Holland. ZHW was built in 1952 and had several German registrations: D-8102 and D-5846.